Given my proximity to the restaurant and my love of their food, I come back to Drago Centro every so often; however, this has recently been only for lunch.I have a love-hate relationship with Drago Centro. I love the food, but the service (especially at dinner) can be…in a word, bad. My last dinner review again pointed out my often-negative experiences with the service here. My frustrations did not go unnoticed by the restaurant; I was invited back to give dinner another go. Myself and my dining companion from the last dinner visit, Diana, put our faith in the chef to create a custom tasting menu for us. 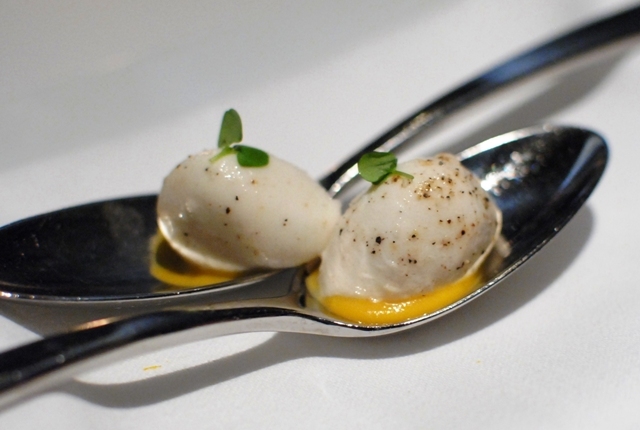 The mozzarella is always solid here, and it was accompanied by a little bit of butternut squash puree. I thought it could’ve used more of the puree as the cheese slightly overwhelmed it, but I still got a nice sweetness to go with the creamy cheese. We had this same dish during our last visit. The langoustine, pounded thin, was tender and flavorful. The pears imparted a good sweetness, and the citrus and acidity from the vinaigrette was a welcome addition. This was probably our favorite dish of the night. Drago Centro is my favorite place for an Italian pasta, and this dish only reinforced that. 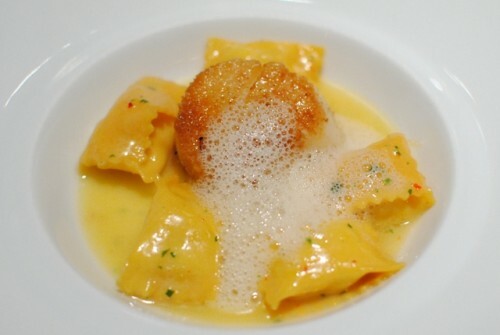 The agnolotti was al dente and the scallop had a great seared crust and moist flesh. There was a little bit of a citrus flavor here too. So good! The polenta was light and creamy, but the sweetbreads were the star here. Perfectly cooked with a nice seared crust and really tender interior, this was excellent. 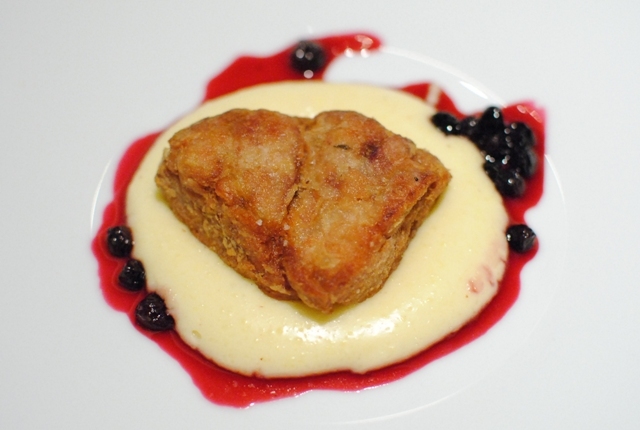 The richness of the sweetbreads and polenta was complemented by the sweet gastrique. The venison was steak-like and meaty and had good flavor that wasn’t overly gamey. 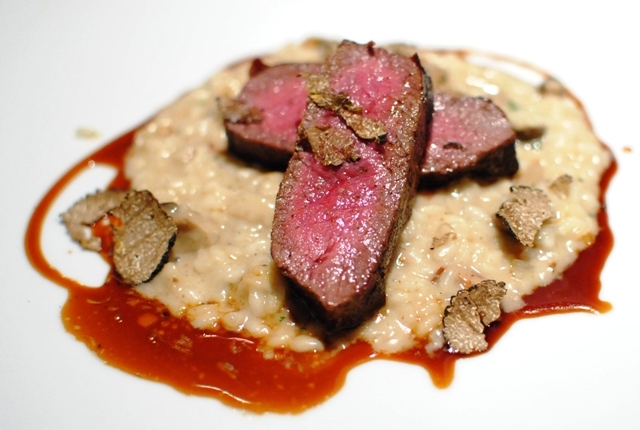 The risotto was wonderful; combined with the shaved black truffles, these added a nice earthiness to the dish. 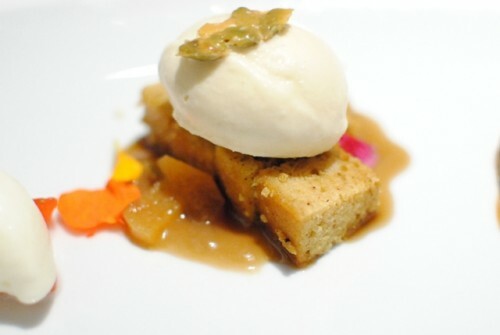 Pastry Chef Jashmine Corpuz presented the next course – a trio of desserts (can’t go wrong with a trio, can you?). These were all very good. 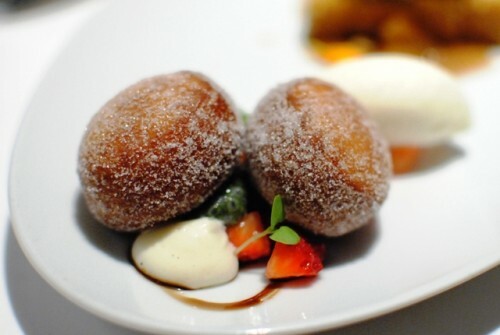 The bombolini were warm, light and fluffy mini-doughnuts covered in sugar. The strawberries and marscapone gelato were excellent with it. The cake was very moist with good flavors, and I loved the brown butter ice cream pairing. 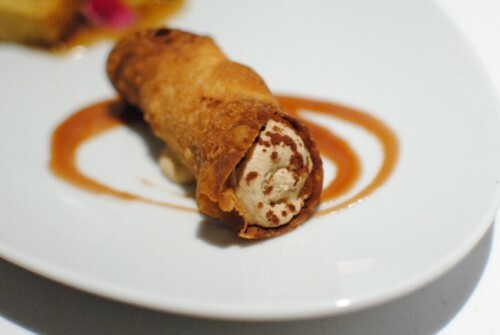 Finally, the cannoli had a light tiramisu cream, which exhibited a rich coffee flavor. My dining companion had recently seen a dessert that Javier of Teenage Glutster experienced at Drago Centro. 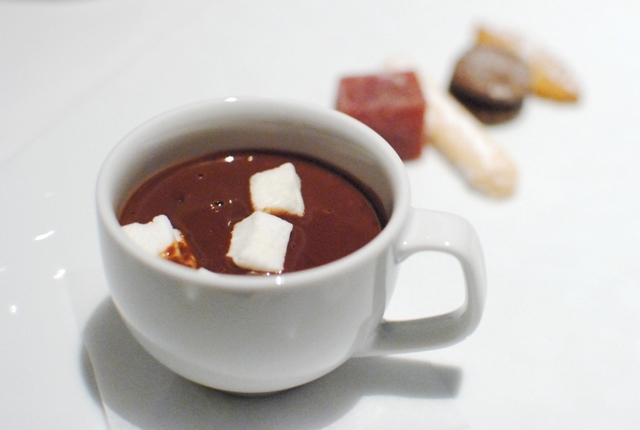 It was a spiced hot chocolate with black truffle foam. This looked so interesting, we wanted to try it! Unfortunately, no black truffle foam was on hand, but we did get a variation of the hot chocolate with our petits fours. Given this wasn’t on the menu, we were grateful that something similar could be put together on the spot. This was a really rich hot chocolate with some spice and definite ginger notes. I liked that it wasn’t too sweet at all, and at times…almost a little bitter, reminiscent of dark chocolate. I enjoyed it – perfect for the holidays and a great way to end the meal. In its complete package, this was the best meal I’ve had here. There were numerous highlights from the food, which is always a strong point (the agnolotti, sweetbreads, veal loin and dessert dishes stuck out most). Service was excellent this time, expectantly so. It remains to be seen if the service can be consistently good going forward, when a special meal is not set up. 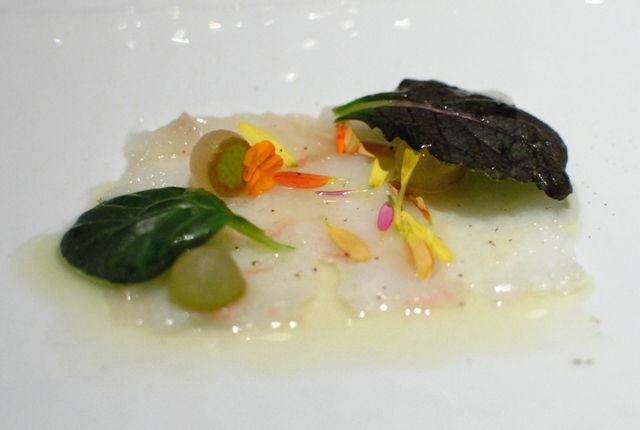 Having said that, I was pretty happy with my experience this night and look forward to my next meal at Drago Centro. Note: This was a sponsored dinner.